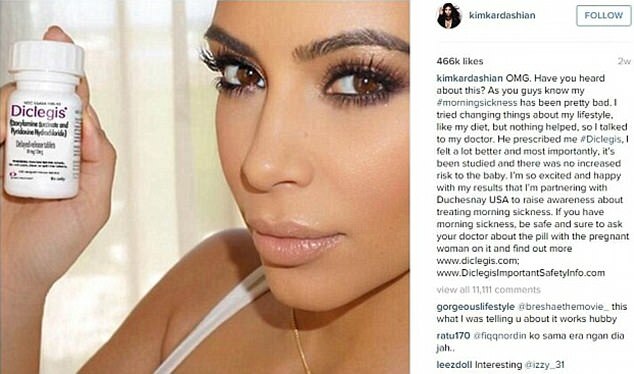 Kim Kardashian has sparked fresh controversy by endorsing a 'risky' morning sickness pill - less than two years after being reprimanding by the FDA for doing just that. She insisted the pill, the only approved drug on the market for morning sickness, has 'no increased risk to the baby'. Within hours, the federal agency hit out at the social media star, calling her post misleading and irresponsible. Kim subsequently removed the post and issued an apology. Now, just 18 months later, she is posting about Diclegis once again. In fact, on Thursday morning Kim posted a photo of herself looking at the old controversial post, alongside a lengthy caption. 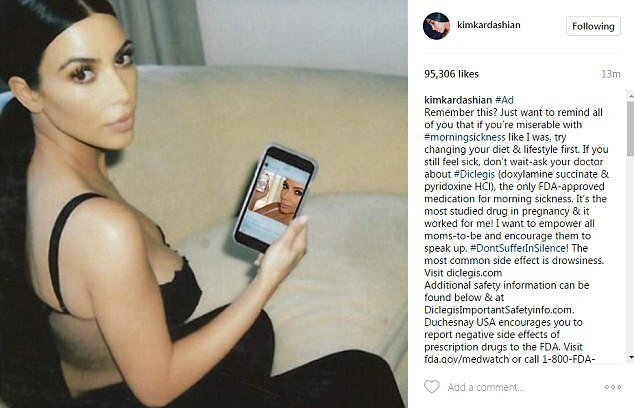 This time, Kim has included a link to the FDA website, and warns there is a side effect of drowsiness. However, some experts warn she should not be posting about the product at all: just four months ago a landmark medical report concluded Diclegis is ineffective, and a waste of money.